The search is over, I have sourced the perfect affordable getaway. The only thing you need to worry about is, well, absolutely nothing! 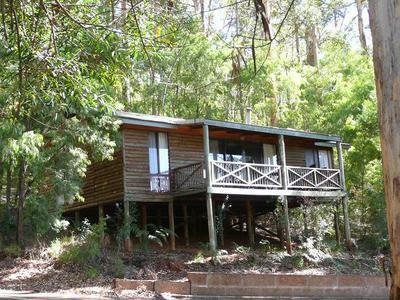 Head down South and escape to Karri Valley Resort. The ideal summer or winter break for all the family, with friends or with your partner. 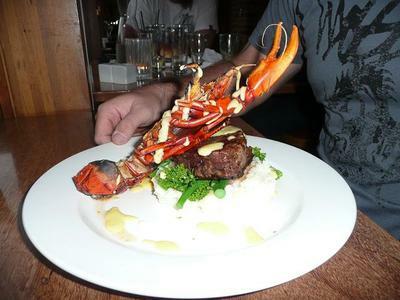 Only 3.5 hours from Perth and 22km from Pemberton town centre. When I first arrived, it felt as if time had instantly stopped as I stepped out onto the balcony of our lakeside room. The moment was as if someone had hit the mute button on the remote. It took me a while to adjust to the silence for the first few minutes, and then eventually I was able to tune into the soft unique sounds of the wildlife and children laughing in the distance.The Beedelup Lake that extended out from under our balcony was so still that it mirrored the Karri Tree Forrest surrounds, creating the perfect picturesque setting for our getaway. View from lakeside room balcony. 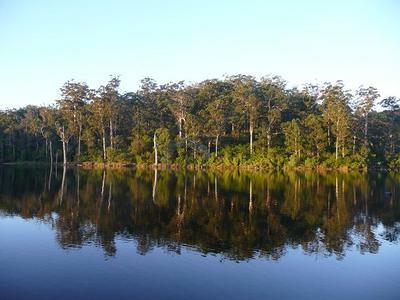 The resort is surrounded by the only natural Karri Forest in the world, and also several species of birds, frogs, reptiles, and mammals. There are a range of activities available to those staying at the resort that are very affordable or free, such as trout fishing, non motorised water sports, mini golf, mountain bike riding, tennis and archery. There are 30 self contained 2 and 3 bedroom chalets nestled in the colourful forest. You can hire DVDS or board games from reception and relax by the log fire place, or bake pizza in the warm winter tree house. Chalets offer private balcony also. 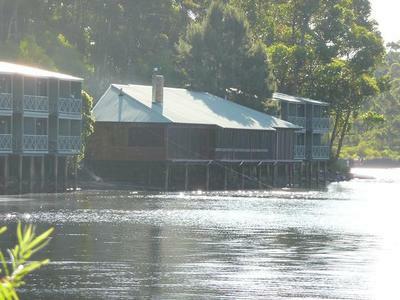 More suitable for couples, there are 32 lakeside studio style rooms with a balcony on the lake or forest views. Whilst trout fishing from our balcony, we were able to also interact with some of the wild and colourful bird life. Fishing from lakeside room balcony, one of the many leisure experiences offered at the resort. After fishing and a short nature walk from our room to check out the Beedelup Falls, we headed to the restaurant for a unique dining experience overlooking the floodlit lake. The menu included local produce and Pemberton wines. After a relaxing meal we headed into the wild night forest for glow mini golf. The next day we enjoyed a full buffet breakfast at the restaurant and headed out to archery. Here we met a very lazy kangaroo who also enjoying the peaceful surrounds that Karri Valley Resort has to offer. We drove into Pemberton for a tavern lunch and to browse the town centre. It was then that we realised we had done so much without even leaving the resort. We headed back to the resort for canoeing, then sat out on the balcony and ordered room service as we enjoyed our last Karri Valley sunset, and opportunity to get lost in time and tranquillity. View of lakeside rooms and restaurant. Next time we will definitely have to have a BBQ in the picnic area and go for a sunset swim. The BBQ area has facilities and play equipment on the river bank. There is also a farm at the resort where you are welcome to feed the animals. It's best to book activities when you arrive. Everything is walking distance and you can park your vehicle right next to your room. 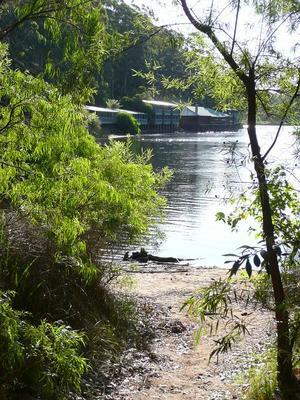 Karri Valley Resort offers the perfect adventure, experience, indulgence and serenity for anyone. Why? For a unique encounter with nature in the Karri Forest.